Many times, we are locked in a situation where we have to search for multiple files with different extensions, this has probably happened to several Linux users especially from within the terminal. There are several Linux utilities that we can use to locate or find files on the file system, but finding multiple filenames or files with different extensions can sometimes prove tricky and requires specific commands. 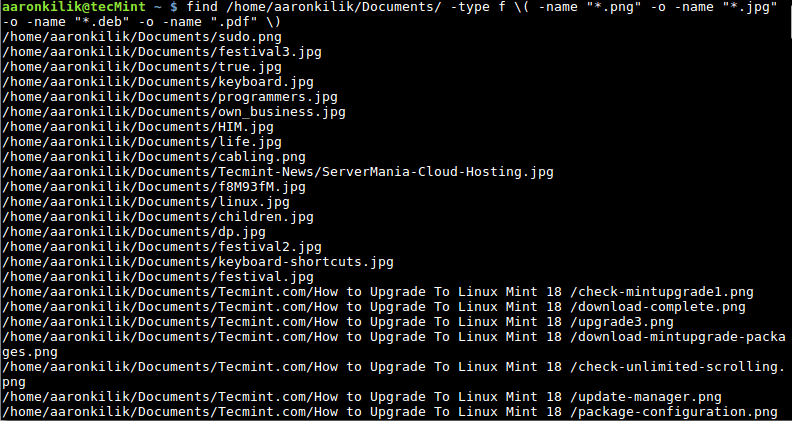 One of the many utilities for locating files on a Linux file system is the find utility and in this how-to guide, we shall walk through a few examples of using find to help us locate multiple filenames at once. Before we dive into the actual commands, let us look at a brief introduction to the Linux find utility. Let us proceed to look at some examples of find command in Linux. It is recommended that you enclose the file extensions in a bracket, and also use the \ ( back slash) escape character as in the command.